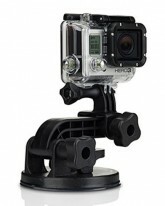 Attach your GoPro camera with this industrial strength suction cup to cars, boats, motorcycles and more. Included short extension arm allows for ultra compact mounting. Engineered to provide a broad range of motion and stability. Proven at speeds of 150+ mph.